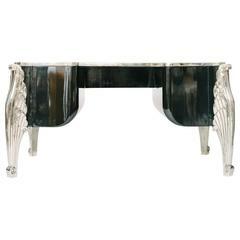 20th century Louis XVI style burl wood bureau plat. 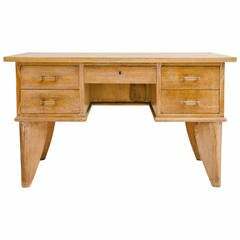 Fantastic French Art Deco cerused oak desk with glass and bronze handles. Front opening for chair measures 14.5 inches wide. Pair of early 20th century painted and gilt French Louis XVI style fauteuils newly upholstered in leather. A beautifully carved 20th century Empire style Curule seat newly upholstered in an ecru mohair velvet.